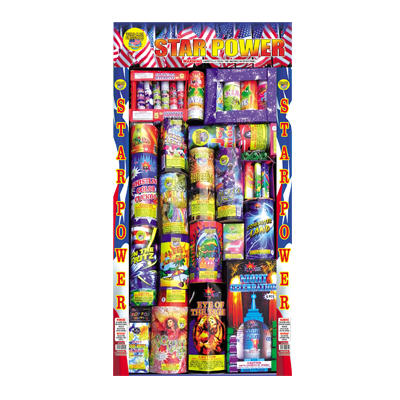 Star Power – Extra large sized fountain assortment that contains several 100 gram fountains and an array of smaller fountains and sparklers. Assorted Snakes - Assortment of classic black snake. Comes with 2 boxes of glow worms, 2 boxes of colored snakes and 2 boxes of classic black snakes. 5 Minute Smoke - 5 Minutes of white smoke.